The number of careers available in the hospitality industry is growing at an exponential rate. In fact, the U.S. Bureau of Labor Statistics estimates that there will be more than 337 million jobs available worldwide by 2023. Working in hospitality can offer a fulfilling career path, but unfortunately, there are many misconceptions and myths that surround the industry. 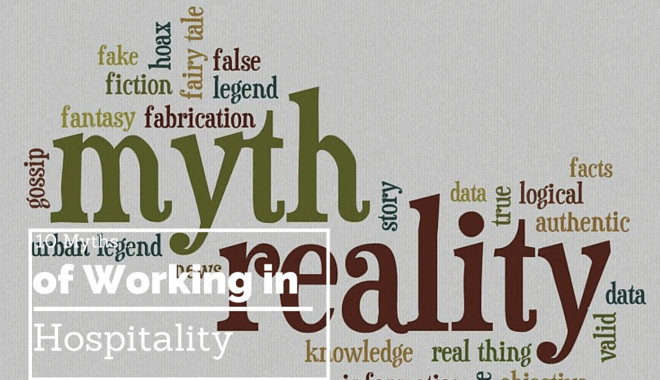 Separating fact from fiction will help you decide if this is the right career field for you. Let’s get this one out of the way. Many people think of hospitality as a “caring” industry and one that is best suited for women. It would be smart for you to drop that mode of thinking right now. 47% of all individuals employed in the hospitality sector in the United States are male. The hotel industry is a component of the hospitality industry as a whole, but the hotel industry is only one small piece of the hospitality pie. The tourism and hospitality industry also includes aviation, cruises, theme parks, restaurants, transportation, and much more. Please excuse while we laugh. People who do not work in the hospitality industry do not know the amount of skill that is required to navigate it. It is true that it is not rocket science, but the successful business within the industry are quite methodical. They are founded on effective strategies and planning, adept employees, and routine training. There is value in their measurable, calculated approach. Do you like to sing and dance? Perhaps you would do well working as a performer on a cruise ship. Do you love social media? Working as a social media marketing coordinator or consultant for independent hotels could be your cup of tea. The point is that, within the hospitality industry, you are constrained only by your personal ideas and not by opportunities. It is true that there are a plethora of jobs as bellhops, maids, servers, and other similar positions that do not require formal training. However, with the right education, you can bypass these low paying positions and jump start your career as restaurant or hotel manager, bar manager, wine steward, or event planner. These positions are more interesting and offer much better pay. On the other end of the spectrum are those who believe that working in the hospitality industry involves only mixing with celebrities and the rich and famous. While this does occasionally happen, 90% of the time it involves just plain hard work. The hotel industry routinely uses agencies to fill empty positions, but this is primarily due to the seasonal nature of the industry, as opposed to lack of technological adaptation. However, if you believe that this is the only route to landing a job at a hotel, then you are sorely mistaken. When it comes to landing the best jobs in the hospitality industry, networking is the key, and social media is playing a growing and critical role in finding qualified individuals to fill job openings. Jobs in the hospitality sector offer plenty of variety when it comes to the number of hours worked. In fact, many positions are part time. If you want to devote more time to your family and still earn a decent living, then these part-time positions can be ideal for you. Because the hospitality industry is a 7 day a week, 24 hours a day kind of business, you can choose a position that works around your schedule. Day shifts, night shifts, and weekends are always available. The hospitality industry offers a dynamic work environment, so it is true that an expert of a field might not do well here; however, that does not mean that all individuals who work in hospitality are uneducated. For example, hotel management is a career by choice, and the process to be accepted into a top program is rigorous – to say the least. The curriculum for a top hospitality program will include geography, business communication, marketing, and accounting, among many other subjects. Last, but not least, there is some truth to this statement, but a half truth is dangerous. The hospitality industry, including the hotel industry, consists of thousands of hotel worldwide and several sub-industries. This is a large salary discrepancy between basic, entry-level positions and those in executive management, and this fact must be taken into account before making any assumptions about the hospitality industry’s pay rates.